Is Your Bank Recognized as the Best in Your Market? The Banky™ Awards are the ONLY awards recognizing the top 1% of high-performing banks. The Best Banks in America™! Will You Be Included This Year? "Everywhere we go, everyone asked us, 'How'd you win that award?' The first year we won it, we grew more than we had in the previous 8 years combined." 1. WHAT’S THE CATCH... IS THERE SOME HIDDEN FEE TO PARTICIPATE? I get your skepticism, but there are NO hidden fees. There’s no fee to nominate your bank, and if you are selected to receive a Banky™ Award, you won’t pay to attend the Awards Ceremony or The Best Banks in America™ Super Conference. (The ceremony is at the conference). You will receive two complimentary tickets for the CEO and an accompanying exec or director. If you want to bring a larger team, you’ll be able to do so at an exclusive “winner’s rate.” This will give you access to both the Super Conference and the Banky™ Awards. 2. WHAT IS A BANKY™ AWARD? Great question! You’ve heard of the Emmys, the Tonys, the Grammys… each award of distinction sets consumer buying preferences for entertainment. The Banky™ gives the same level of distinction and differentiation for community banks. 3. WHY WOULD I WANT TO WIN A BANKY™? Unlike most banks that think differentiation means lofty platitudes like “we have great customer service” or “our people make the difference,” you know that you need extreme, meaningful differentiation from your competitors. Imagine the buzz in your market when you are able to announce that your bank is recognized among the Best Banks in America™. You’ll soon find that The Banky™ is a gateway to premium pricing. 4. WHAT AWARDS ARE GIVEN? Three elite banks will be selected as finalists for the Extraordinary Bank of the Year™ Award. Each will present their accomplishments on stage at the Awards. Then the audience of top-performing bankers will vote to choose this year’s Extraordinary Bank of the Year™. 5. WHO JUDGES THE AWARDS? We use a panel of three independent banking industry experts, as well as thought leaders, to review all the applications, and select Banky™ winners, category finalists and winners, and the three finalists for the Extraordinary Bank of the Year™ Award. The identities of the judges are concealed until the awards ceremony to prevent banks from lobbying the judges. 6. DOES IT PAY TO “KISS UP” TO ROXANNE EMMERICH, FOUNDER AND CHAIR, TO IMPROVE OUR CHANCE OF WINNING? I like your moxie, but you’d be better off plowing that energy into your nomination package. Roxanne is not involved in the judging—it’s completely independent. That said, she does enjoy dark-chocolate-covered strawberries. 7. WHAT DO THE WINNERS RECEIVE? Banky™ Award winners receive an award, a red carpet photo op, and a complete PR/marketing kit, and a video to promote their new Banky™ Winner status. They also receive two complimentary tickets for The Best Banks in America™ Super Conference and Extraordinary Banking Awards™ Ceremony. Category winners receive all of the above, plus special recognition as a category winner. The Extraordinary Bank of the Year™ Winner receives a NEW CAR—yes, really—wrapped with the winning bank’s logo, announcing their win. Plus, a $25,000 donation, made in the name of the bank, to fund the construction of a school in Africa. If you win, the car is yours to keep… forever. 8. WHERE IS THE AWARDS CEREMONY HELD? 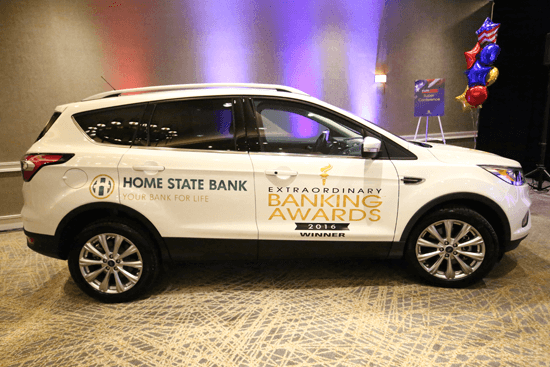 The Awards are a part of The Best Banks in America™ Super Conference hosted by The Institute for Extraordinary Banking™ in Minneapolis, Minnesota. 9. WHAT ARE THE DATES OF THE BEST BANKS IN AMERICA™ SUPER CONFERENCE AND EXTRAORDINARY BANKING AWARDS CEREMONY? The Best Banks in America™ Super Conference runs from September 16-18, 2019. The Awards are the evening of September 17. 10. HOW DO I NOMINATE MY BANK? Simple. Just have your marketing department or executive assistant complete the enclosed application form or download an electronic version at BankyAwards.com/Nominate. 11. WHY SHOULD I ATTEND THE SUPER CONFERENCE? Some of the country’s top community bank CEOs have attended the last three conferences and said they found two years’ worth of implementation ideas at each event. When you attend, you’ll hear the real strategies used by award-winning banks—many performing in the top 5% of all community banks. These are strategies that will increase your profits. Not theory, but proven, results-driving, real-world, practical strategies that will grow your bank.